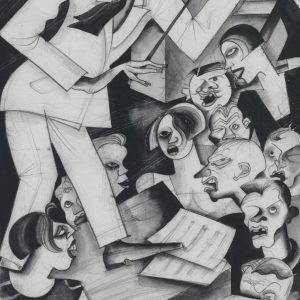 Studied at the Odessa Art School under Kiriak Kostandi from 1915-19 and, from 1916, worked as an illustrator for local journals like Theatre & Cinema, Melpomena, Bomba and Ogonki. 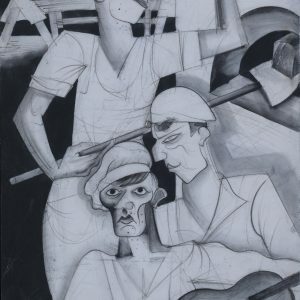 In 1918/19 exhibited with the Odessa Society of Independent Artists. Worked for Agitprop in 1920/21 and, along with Sigismund Olesevich, Sandro Fazini and Vladimir Muller, was one of the ‘finest Odessa and Petersburg artists’ hired to decorate the famous literary/artistic cabaret Veselaya Canareyka (The Happy Canary). Close interest in cinema shaped his graphic art, whose savage irony had much in common with German Neue Sachlichkeit; he became known for his actors’ caricatures published not just in Odessa but also in the prestigious Moscow magazine Sovietsky Ecran (‘Soviet Screen’), launched in 1925. Also taught at the Odessa art studio run by Yuri Bershadsky until 1928. Later accused of Formalism. Refused to quit Odessa following the Nazi invasion. Final cartoon was published on 11 July 1941; massacred, with thousands others, in the Jewish ghetto three and a half months later.